At our Meriden, CT, dental office, you’ll never have to worry about receiving noticeable, silver fillings as a treatment for cavities. Instead, we use fillings that are tooth-colored and metal-free to help patients enjoy cosmetic benefits for their smiles as well as renewed oral health. 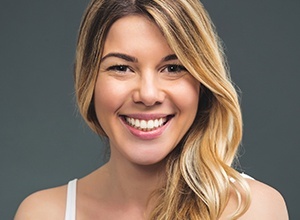 In addition to providing a more natural and seamless look, tooth-colored fillings are much less sensitive to hot or cold temperatures and require less of your tooth to be removed when they’re placed. This means our team can preserve more of your natural tooth structure as we effectively fill much smaller areas. Why Would I Need a Tooth-Colored Filling? Daily brushing and flossing are critical to avoiding tooth decay. However, even the best oral hygiene routine cannot prevent one in a million oral bacteria from managing to cause a cavity. Bacteria in your mouth survive on food particles that remain on your teeth after you’ve had a meal. Like all living organisms, bacteria excretes waste, and it is acidic and actually eats away at tooth enamel. Once enough has been eaten away, this is what constitutes a cavity, for which a filling is usually the best solution. Light-cured composite resins—more commonly known as tooth-colored filings—were introduced in the 1970s. Up until then, dentists used a variety of different materials to fill cavities. Ancient man used beeswax. Then, in the early 1900s, metal such as gold, silver, and tin were used. Eventually, mercury was added to a blend of these metals for strength and pliability. Scientists discovered that mercury could possibly be linked to a number of health concerns, so for many years a viable alternative was pursued. Now, dentists almost exclusively use composite resin to repair tooth decay. The materials used are now equally as strong as their metal cousins, and they offer a number of other advantages, too. Composite resin is made up of plastics and a powdered glass filler. This material is specially blended to match the color of your existing tooth structure. With a tooth-colored filling, Meriden dentists can also strengthen your tooth’s structure. A metal filling was only wedged into the space that your dentist drilled away. Composite resin, on the other hand, bonds directly to your tooth, thereby evenly distributing the pressures of biting and chewing. In this way, the incidence of cracking and leakage around the filling is less likely. Once your filling is completed, you’ll only need to brush and floss your newly restored tooth just as you do your other teeth. With proper hygiene and regular checkups, you can expect your restoration to last for years and years. Do you currently have a cavity or old metal fillings you’d like to be replaced with a better looking alternative? Tooth-colored fillings could be exactly what you need, so be sure to contact our office today for an appointment.